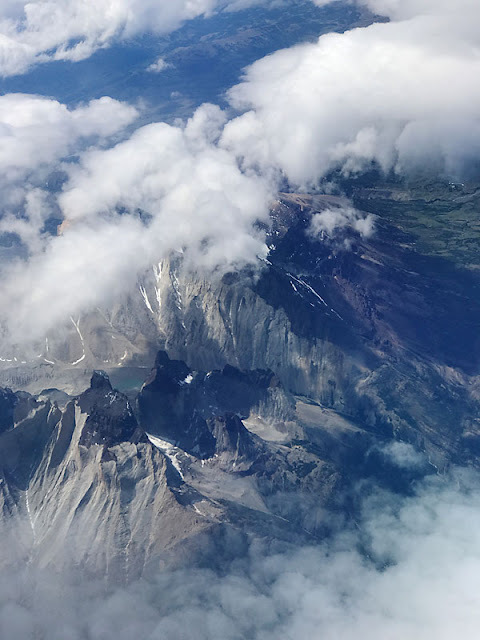 I was just chugging along in my Santa Cruz trek in Huaraz region of Peru when I overhead the guy behind me mentioned about flying from Punta Arenas to Santiago. 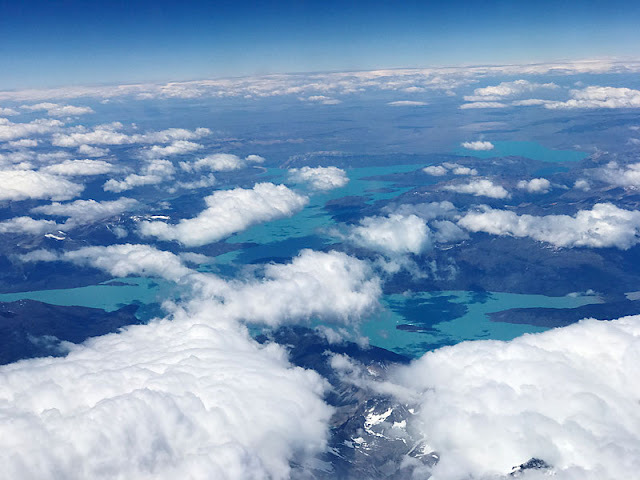 He was saying something along the lines about having the most amazing view of Mt Fitz Roy in Patagonia. 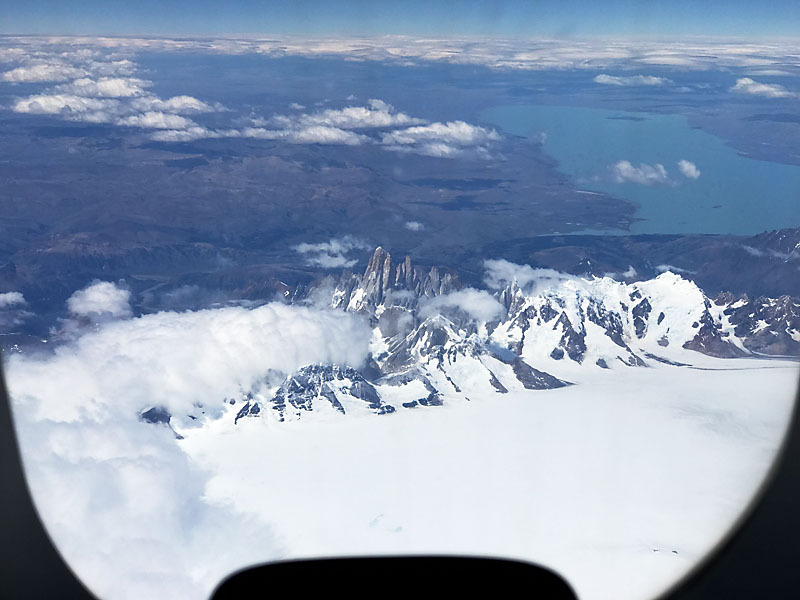 This jolted me alert as I had been contemplating flying down to the Patagonia region due to my limited schedule, but somehow had never thought about the ability to see the famed mountain from the air. I spoke to him briefly, and before I know it, my heart was kinda set on the flight. Of course, it was all down to the flight cost. I have been searching on and off and it was only in Cuenca Ecuador when I finally settled down to confirm my plan. 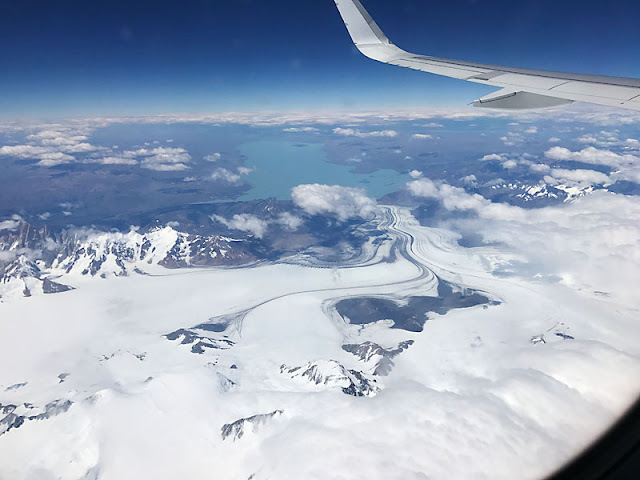 Apparently in summer, there are flights from Santiago to Puerto Natales and I managed to find, on the Chilean LATAM airlines site, a flight from Santiago to Puerto Natales at US$87 all-in! Considering that this 3-hr flight saved me a few days of travel southwards, and likely money as well, as the long distance buses while comfortable, do add up, it was a done-deal. And of course, there are the views :). The tip from my trekking friend Thomas was, on the northbound flight, seat on the right. So for me, I had to seat on the left. 23.5hrs to my flight, I login to the airlines website to check-in and select my seat, and to my horror, all the leftmost window seats are all taken! I had to settle for a middle seat and kept a tiny flicker of hope that I might still get a window seat somehow. Well, the flight was quite full. So there I was, a fidgety figure frequently looking wistfully over to the window and trying to take pics. 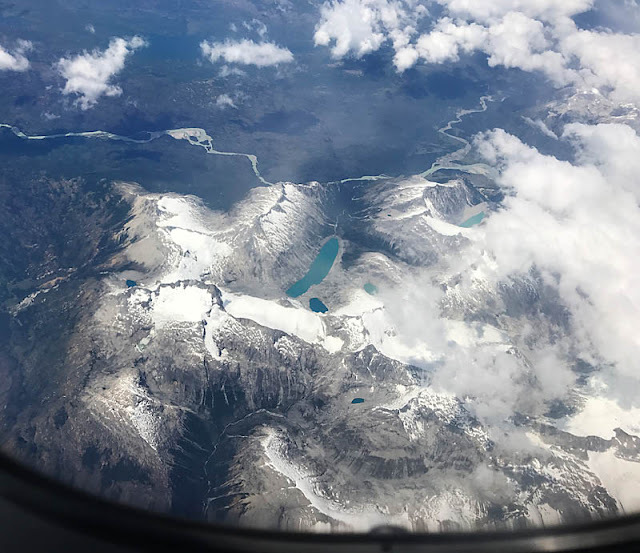 The lady at the window seat was very understanding though, but it was still rather inconvenient stretching across (her chest) to the window to take the pictures. 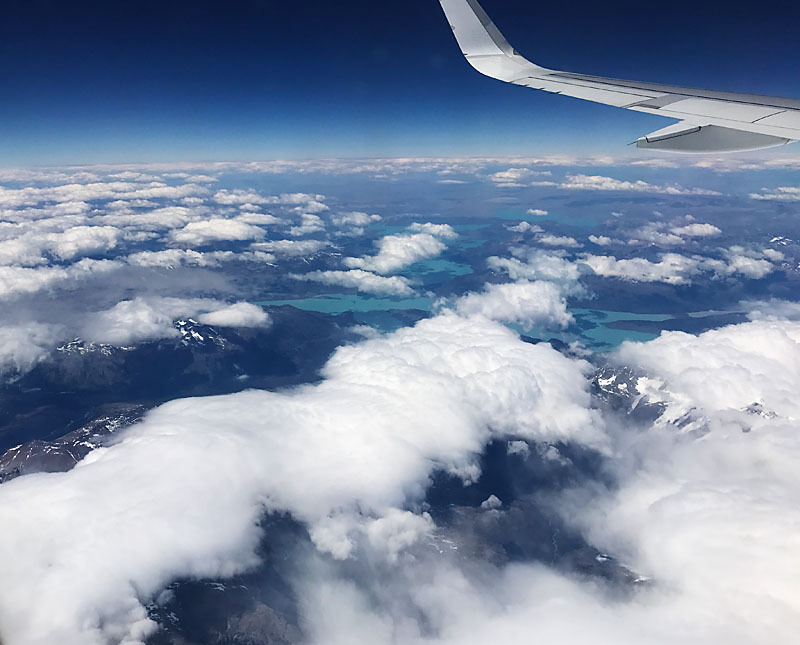 But ironically when Fitz Roy came into view, I still did not recognize it and wondered briefly which beautiful mountain was that! 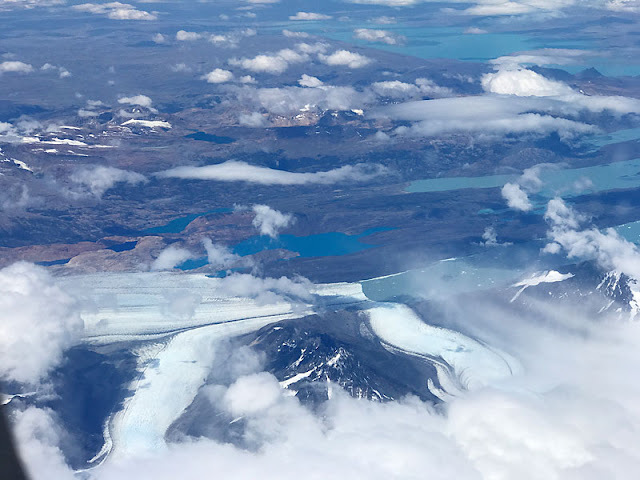 Somehow, up to this duration of the flight, it did not occur to me that beside Mt Fitz Roy, there are more to Patagonia from the air... At some point, some guy at the front mentioned Perito Moreno, and an internal lightbulb connected. I was almost standing up, craning my neck to its limits but alas, the clouds seemed to have thickened quite abit further south and I could not even catch a glimpse of it, or even what I am seeing. I can only cross my fingers and my toes and take whatever pics I can. 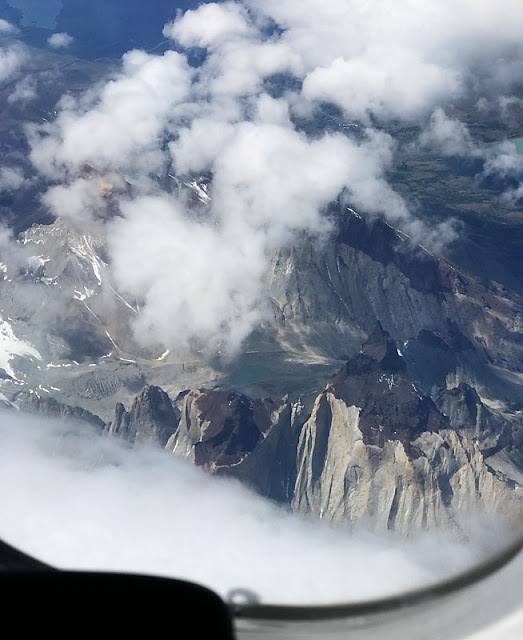 When the plane flew over the Towers of Paine, the clouds eased up a little just to tease me with a glimpse of where the Towers are. It was a little disappointing. Nevertheless, I'm really still quite happy to see the landscapes of Patagonia from up in the air. While I have seen the famous landmarks of Patagonia on land (Cerro Fitz Roy & Torre, Perito Moreno glacier, Torres del Paine), it would be cool to be able to see all of them in the air in one flight. And that commercial flight path just allowed that. 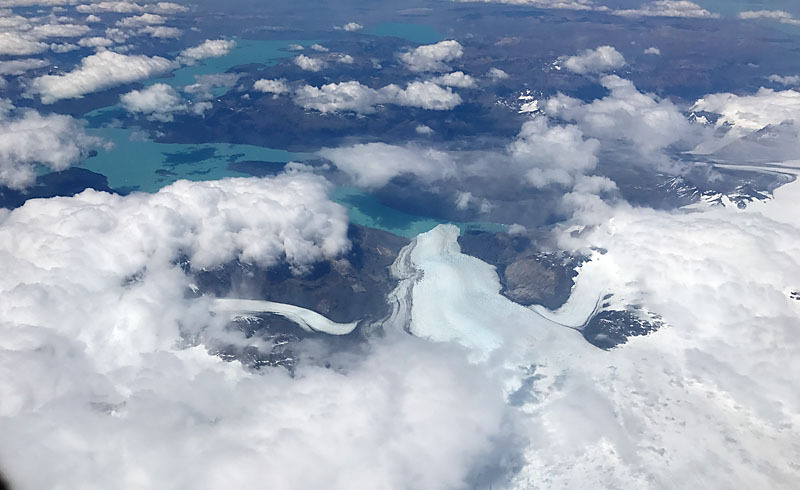 The notorious weather of Patagonia had allowed me to see one and I guess I should be contented. 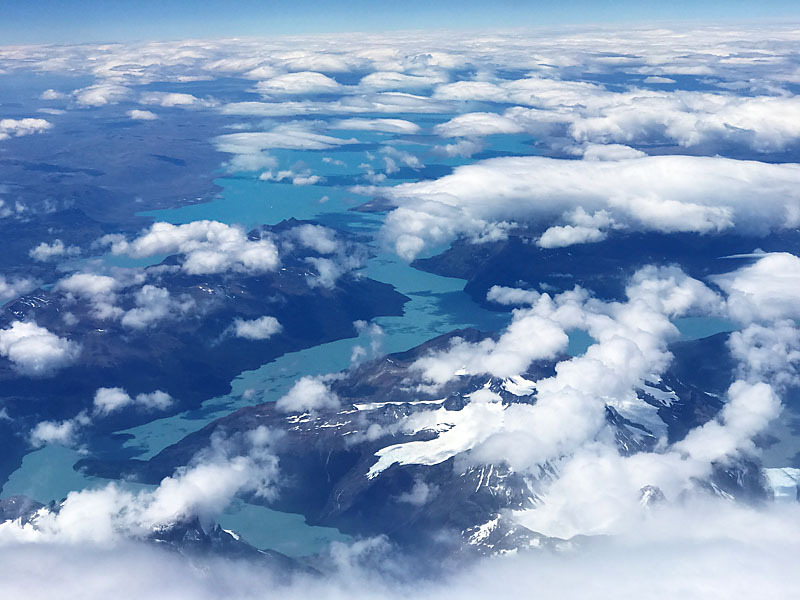 For those who's doing the Patagonia route should consider this flight. Aside from Santiago, you could also fly from/to Puerto Montt as I believe the flight route down to Punta Arenas or Puerto Natales should be the same. Aside from LATAM, Sky Airlines fly some of these routes too and they have affordable fares if booked in advance! And remember, for southbound, get the window seat on the left. For northbound, get window seat on the right. And hope for good weather (less clouds)! Look at the colours of the lakes!! 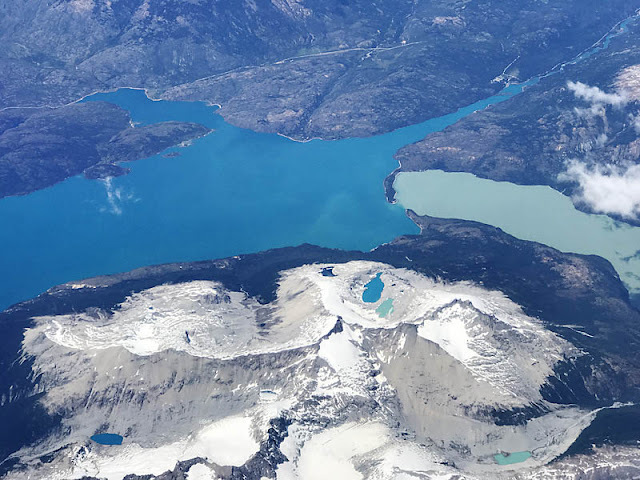 That's a glacier I believe!